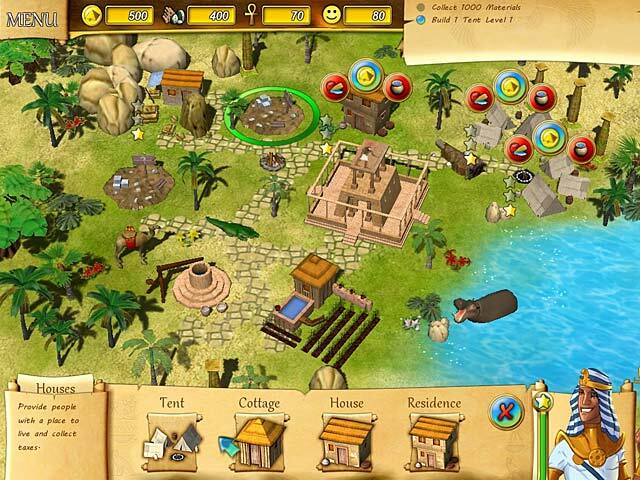 Build glorious Egyptian towns and expand your realm in Fate of the Pharaoh, a fun and challenging Strategy game! After being attacked by a greedy enemy for years, the magnificent realm of the pharaoh has crumbled. Construct homes for your people, set-up production, trade, please gods, fight crocodiles and dangerous cobras, all while building marvelous monuments and famous wonders! 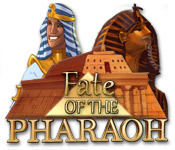 Fate of the Pharaoh is rated 3.7 out of 5 by 17. Rated 5 out of 5 by Bumbles2 from A fun family game !!! This is an excellent family game. My G'kids want more !!! The story is quite entertaining, You know as we played the different levels my G'kids were asking questions about Egypt so I also found this game to be educational as well. It was definitely a lot of fun to play. The music felt like we were in Egypt...the artistry is extremely well done...nice and clear and objects easily found. There are some challenging areas for beginners...I had to explain it to them and once they understood what needed to be done... they found it easy to do. I found this game to be a time to bond with my G'kids...and also a great learning tool for this type of game...all in all we had a lot of fun playing !!! I don't think you'll be disappointed...its a great game to have in your library. Have fun all...like we did !!! Rated 5 out of 5 by tutortime from Great Game! I love games like this and I especially love the fact that you can play in a relaxed mode. For me, having the opportunity to take my time and build everything is wonderful. Rated 5 out of 5 by SimbaKomba from Fun! Fun! Fun! I loved this game! It is a clicking/builder/strategy game similar to Timebuilders, Royal Envoy etc. It starts out quite straightforward and easy and gradually becomes more and more difficult. It is a lot of fun, especially if you like an Egyptian theme. The graphics are clear and a pleasure to look at, and the animations are wonderful, with little suprises throughout the levels. The soundtrack is great and there is a wonderful sense of humour throughout the entire game. 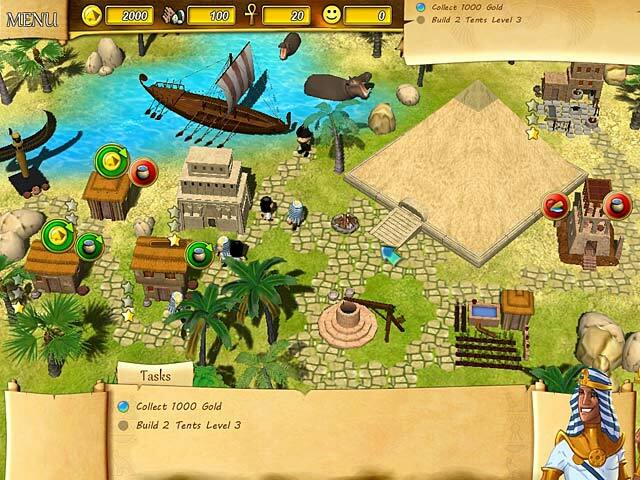 Rated 5 out of 5 by Jules1414 from Good Egyptian game! Facts are accurate and good fun! Rated 5 out of 5 by silvereagle from Loved this game I do not listen to music when I play games so hence the 4 star, but the other sounds are good. Very fast on the later levels and challenging, enjoyable good fun story, thieves to get rid of among other things! Definitely on some levels have to think about it before you start clicking the level. Easy on the eye and particularly like the fact that you do not have to buy workers you have continuous unlimited amount! Great fun, even relaxing still one of my all time fall back fav,s. Never get tired of this game, and play it very often as relaxation like coming back to an old friend! Even though I have played through this many times I still get caught out on some levels if I am not paying attention. 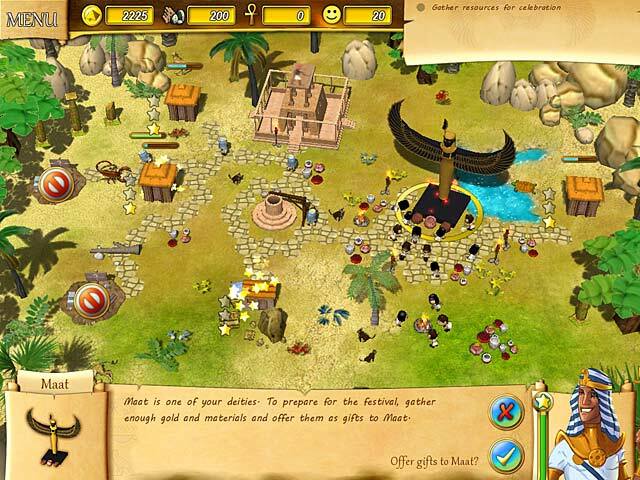 Rated 4 out of 5 by mrm2006 from Help the Egyptian Pharoah Rebuild His Lands This is a typical building game - set in the time of the great Pharaohs of Egypt. The great Pharoah of Egypt wanted a settlement of peace and harmony and so he built one and ruled it as such for many years. Until, one day, an evil foe attacked and destroyed everything the Pharoah had built. He realized he had to continue to maintain the wealth and peace his kingdom had lived in for so long but to do this he had to rebuild everything. So, off we go to build tents, houses, quarries, wells and much, much more. Graphics are really good, if not on the smallish size. Fortunately, there isn't too much eye for detail necessary. The music is appropriate for Egypt - very flutish snake-sleeping kind of music. The sound effects were also really good in that you could hear the hammers and your people talking amongst each other as they went about their tasks. There are 2 modes of game play. One is the typical race against the clock to get everything done mode - not interested, thank you very much. The other is a "relaxed" mode where you can take all the time in the world (not really) and get the job done at your own pace. That's for me! And tasks there are aplenty! Because not only do you have to build tents, houses, cottages, wells, quarries, etc., but you have to know WHEN to build what. For instance, if you build your tents/cottages before you build a quarry or well, you won't earn the money you need to continue your upgrades and construction. So, it is a bit of a strategy game as well. As you level up and complete your community, you will have to send your ships filled with gold to the opposite side of the river to start a community. While I found this game both relaxing and entertaining, it is not for me and so I will not be purchasing it. I believe I already two (possibly 3) of the best building game series on the BFG site already. Maybe after I've played and replayed them a few times, I'll come back for this one - lol. Great for beginners and experts alike. Come, let's build Egypt together! ENJOY!